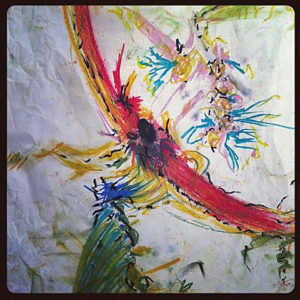 The Workshop Art and Spirit led by the venerable Coeleen Kiebert, is a way to access and define one’s creative vocabulary, personal imagery, art-making process and style. Held at her stunning sea-view ceramic studio in Rio Del Mar – which also manages to be intimate and comforting – we found sharing, guidance and time for insights. While I’d taken this course in a longer format over a decade ago, it simply can’t be called a repeat; I am just not the same artist as when I first learned these methods. My goal was to arrive with as few expectations as possible, stay in the moment and tell the truth. Oh, and to circle back around to the intelligent, protective energy that Coeleen provides. What a week! Day One: Re-steeping myself in Coeleen’s descriptive creative process and beginning again with the making of a found imagery collage on a huge 18×24 paper support. We are silent and it takes hours finding the pictures and words to select, where to place and interrelate each piece. 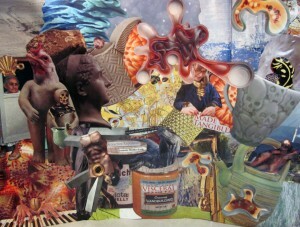 The collage-making proved intuitive and I did not over-think it. Coeleen suggested we pause and look for evidence of the four elements in our imagery and colors. I found tons of Earth (natch), reasonable amounts of Fire and Water, but almost NO Air. When the seabreeze kept lifting my unattached piles of papers and blowing them upside down and into different arrangements, I decided that Air was playfully present and I did not need to try to represent it with imagery. I dreamt of my images that night and returned in the morning to attach the last ones before we gathered to share and respond. Day Two: Collage completed, Coeleen introduces The Map, a conceptual grid of thirds which aids in interpreting our images by where in the rectangle they have been placed. The grid includes a continuum from unconscious to conscious, higher and lower realms, fears, undeveloped concepts, dreams, outward and inward movements, archetypal and Shadow areas. What images and colors did I repeat or put in prominent positions? What meanings can I pull from them, literal, analogic and metaphoric? These represent a language I think in: a glimpse of my image vocabulary. She suggested we pick three images and fashion them in clay, recommending that one of them be an image we don’t quite understand or are disturbed by. I started with the piano-playing hands and the seed image from the lower left, then went to the straight-forward ceramic pitcher, the vessel near the center. Side pieces appeared, but it was great to work with clay independently of needing it to have any sort of outcome: just be there and be attentive and responsive to what comes up. I could not decide on a third piece, but slept on it. 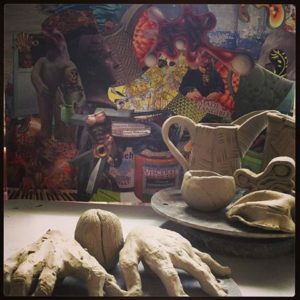 Day Three: In the morning I quickly made two clay pieces from collage imagery I did not understand. They were curvilinear and abstract, and I wound up liking both really well, even if I still didn’t quite get them. In the late morning Coeleen guides us to The Doodle as way to access a personal style. We have a few warm-up doodles and we’re off for an uninterrupted time, moving the oil pastels silently and goal-lessly over the page however we like. And, yes, it IS touchy-feely in just the right way: a supremely visceral and kinesthetic experience for me. Outcome is not important, but I do find myself wondering what the page “needs” to express itself: Another color? Another series of marks in this corner? It was a dialogue. We hung our doodles next to our collages and began to notice similarities of colors and patterns, the division of space, the energy expressed. The collage and doodle processes are so different, and yet the results are clearly cousins! Day Four: Time to doodle with the clay! Grab a grapefruit-sized lump of clay, work with eyes closeddoodling in 3D for at least 15-20 minutes, open your eyes and continue working. Out came this giganto spiky pod thing! 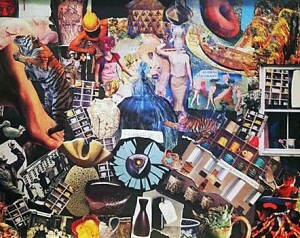 What is similar here to my previous collage and doodle imagery? What has evolved? Insights? I’m beginning to think I enjoy seed pods and potential growth more than I thought I did. Day Five: This last day is dedicated to refining the clay pieces and making one last foray into something we each wanted to understand better. I found myself making another collage. In this one I specifically was asking to understand what the concept of vessel means to me. The night before I had looked up all the meanings of the word, so I let myself find the right imagery for ships and veins and containers, even metaphoric ones as in, “He was a vessel of the Lord.” I placed the new collage next to the old one, with my doodles and clay work alongside. I find only a few connections, and only the ones I had intentionally put there; I’m spent. But the other workshop folks pointed to one similarity after another, the unity being obvious to them. And obviously I have tons more to apprehend, which I take as a Very Good Thing. Coda: I took my wet clay pieces home, finished and fired several. The one I still don’t quite understand – the screw-like piece taken from the first collage – got a coat of black underglaze and after firing it, I covered it unevenly with thin gold leaf. 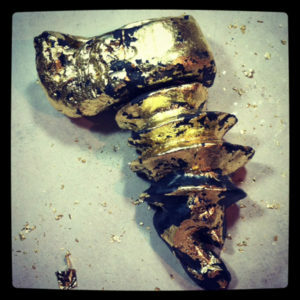 The aim is to have it look more like the mysterious gold object (originally an artifact in a National Geographic.) It’s hanging on the wall a glance away, just to the upper left of my monitor, the spot on The Map where dreams reside. – Liz Crain, who is so happy to be working this way again, she signed on for six more weeks at Coeleen’s studio starting in late October! You cannot watch and watch and watch, read and read and read, talk and talk and talk, think and think and think about tightrope walking and say you are actually doing it. OK, the watching, reading, talking and thinking will help line yourself up right for the doing, especially if you try to be fully present as you watch closely, read the right sources, talk to the right crowds, think about it in an associative and retentive manner, and maybe – or even especially – run through the related physical motions. They will most certainly lead you to better observations, reading material, conversations and cognitions galore. And if they lead you to the doing part, you might be so well-rehearsed in mind, body and spirit, you surprise yourself with how simple and honest it feels. Honey, that’s good rehearsing! As Olympic Gold Medal figure skater Scott Hamilton has reportedly said, it’s also “skating stupid.” The doing falls out of you because you have successfully absorbed the Preparatory. The watching, reading, talking, thinking, even the pantomiming, have transitioned you to the Repertory. Preparatory. That’s still where I’m at with designing my Beginning Ceramic Handbuilding class. The actions I’m involved with right now are definitely not the real teaching. All this gathering, editing, organizing and questioning are totally necessary to manage a good run when the time comes. 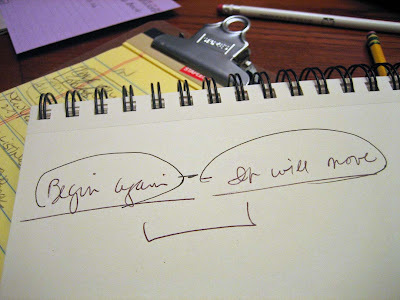 If you want more of what’s going into that, my recent two posts here and here do some pretty elegant expository hand-wringing about “my process,” such as it is. There is, however, a larger motivation for aligning myself with the vital differences between preparatory/repertory – or theory/practice – and that’s because the students who will come to study with me will experience their own version of it. How can I guide them as they transit the continuum from hearing, reading, watching, etc. to doing? We both know that all the talking and reading and showing and sharing we do are but the foundational intro or interlude to touching the clay and moving it around with intention. 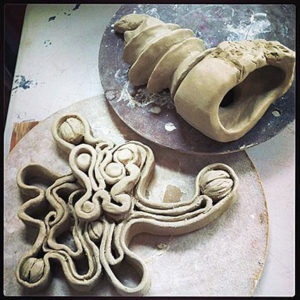 Hell, we all can practice the valuable Coeleen Kiebert exercise of physically assuming the positions of our pots and sculptures, but it’s ONLY when we mold, pound, coil, pinch, carve, smooth, sponge, brush that we deeply know what this clay stuff is for ourselves. Some of these beginners will undoubtedly run gladly off in many directions, full of joyful assumptions. Wanting to do it all at once perfectly, attempting to swallow the clay universe in one gulp. Acting as if Spacetime didn’t include the sequential time part. That’s where I think the heart of my guide role is: pacing the doing. 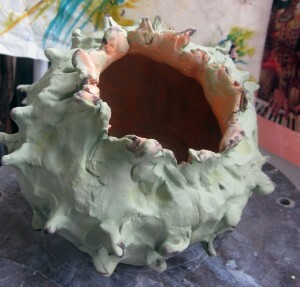 Intertwining the cognitive with the active in our tiny corner of the Wide World of Clay. Supplying a studied but ultimately idiosyncratic version of a sequential scaffold for them to climb around on, lift by lift. Clay work taught me patience and presence. Well, not so much taught as forced them upon me, as I was definitely of the Fly Into Flying bent as a newbie. My endless groundings and crashes lasted years more than perhaps needed. Could I have spent more time on effective Preparation? Could I have had better scaffolding? Maybe. Then again, maybe not. Because of my experiences, I don’t expect to save any artist from their personal process. But I do believe the least I can do as their flight instructor is to shed a bright and true spotlight onto the highwire act and the ladder up to it in our spacetime arena and encourage them to give it a real try. Class Nuts and Bolts: 6 Thursdays, 2-5pm, Session I: Feb 23 to March 29, Session II (with different techniques and projects): April 12 – May 17. Held at the Santa Cruz Mountains Art Center, 9341 Mill Street, Ben Lomond, CA, 831-3364ART. If you’re so inclined, you can call or register online at www.MountainArtCenter.org. Class is $180 for Members/$200 Non-Members. Why Begin Again? A New Year’s Resolution! This post is a living example of itself (aside: would that make it a Strange Loop?) and I couch it purposely in the belly of the New Year, a very hard time to ignore the call of renewal and beginning again. I also couch it in the time of a retrograde Mercury, an esoteric period of reviewing and re-doing, especially one’s words and communications. The ramifications of Starting Over is a complicated, book-worthy topic, which impels me to distill it into a rough “Whereas and Therefore” Resolution format instead of my typically wordy prose, which would take…..ahem…..a book! Whereas I have “taken” (by virtue of my continued volunteering and actually listening to every lecture and demo) Art 7A Ceramics: Handbuilding at Cabrillo College around 27 times. Whereas I have learned it is pretty much impossible to reproduce an artwork exactly, whether it is a master’s or your own. Whereas I have watched A Christmas Story at least 47 times, Harold and Maude, 15, Brave Little Toaster, umpteen-zillion and have read Norma Jean The Termite Queen at least five times, enjoying each repetition (mostly) anew. Whereas I recently learned that the creators of Blue’s Clues, a Sesame Street-like program on Nickelodeon, were initially so short of cash they repeated each program every day for a week and the series was a hit precisely because of that. Whereas I have experienced the phenomenon of learning a new word or concept and then hearing it or seeing it used all around me. 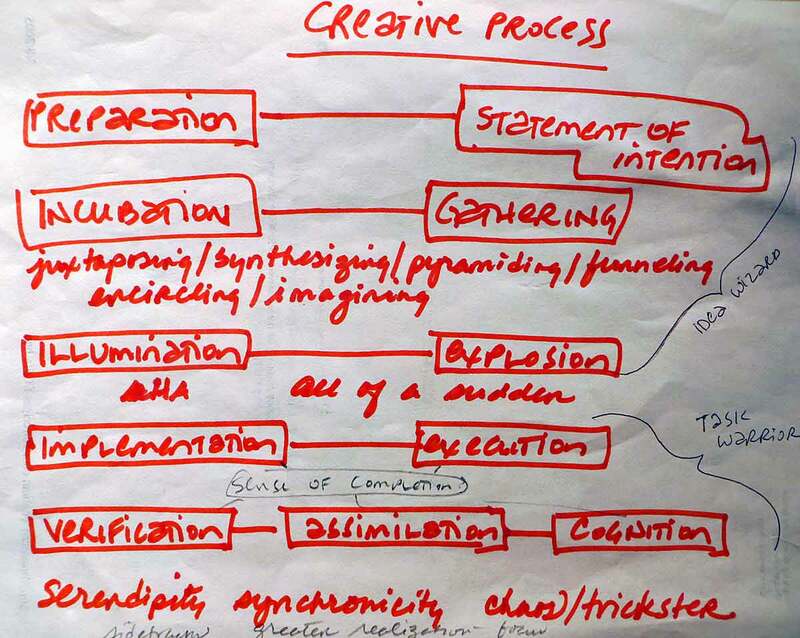 Whereas my original teacher of the Creative Process, Coeleen Kiebert was fond of saying, “Begin again, it will move,” (that’s a photo of my actual notes from that class up top) and she emphatically honored all steps of this process, including the stages that appear as blocked or fallow, such as Gathering. Whereas the Universe is ever-expanding and our cells are entirely replaced every seven years, yet still retain our true essence. 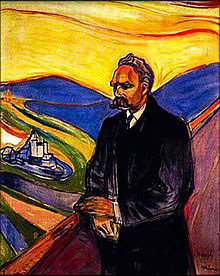 Whereas I notice that if I cultivate my dreams and make efforts to write down dreams and dream snippets and the hunches and connections I get from them, eventually and upon review, I can make meaningful connections because of the recurring themes and images. Whereas I am loving words such as, “let me repeat that….” “you can say that again!” “lest I repeat myself….” and “it bears repeating,” especially when said with enthusiasm and wonder. Therefore, be it Resolved (solved again?) that my enthusiastic learning and re-learning in all things with heart and soul truth in my life continue wild and unchecked this entire year because I stay open, present, cognizant, energetic, healthy and able to respond.